From the earliest days, streams were among the most important natural resources sought after by native Hawaiians. Battles were fought and lives sacrificed for the right to use stream water. The Hawaiians called freshwater wai, and considered it to be sacred. People using wai from streams took only what was absolutely necessary. They were expected to share the wai with others. This was done without greed or selfishness. Such practices gave Hawaiians their word for law which is kānāwai, or the “equal sharing of water.” Water was so valuable to Hawaiians that they used the word “wai” to indicate wealth. Thus to signify abundance and prosperity, Hawaiians would say waiwai. In keeping with this concept of wealth being fresh water, the traditional land tenure system in ancient Hawaii had at it’s very core the presence of streams, or kahawai. Native communities were arranged in land divisions called ahupua‘a (see illustration at left). Although of many shapes and sizes, each ahupua‘a consisted of three area types: mountain, plain, and sea. Although each of these sections were distinct and separate, they all shared a common factor . . . streams. Streams would begin up in mountain forests, flow into the plains, and then empty out to sea. These streams provided the people living in the ahupua‘a their wealth. Streams allowed certain mountain plants to grow and flourish. These plants provided the material for native Hawaiians to produce medicine, build canoes, make nets and fishing lines. Coming from the mountain, wai flowed into the flat and sloping land between mountain and sea. Here in these plains, ancient Hawaiians used the wai from the streams to grow their food crops. They constructed ditches called ‘auwai to divert water to fields where taro, banana, breadfruit, sugar cane, sweet potatoes, and yams grew. Taro, or kalo, was one of the most important plants used by native Hawaiians. It was carefully cultivated in flooded fields called lo‘i kalo. These lo‘i kalo required continuously flowing wai from streams in order to grow. 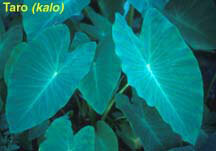 Without cool flowing wai, kalo could not flourish thus depriving native Hawaiians of a very important staple food. After watering their crops, Hawaiians allowed the excess wai to return to the streams. This practice allowed others downstream to also use the wai to irrigate their plants. Often at the shoreline and close to the mouth of streams, Hawaiians built fishponds called loko i‘a. In these fishponds certain kinds of fish, crabs, shrimps, and seaweeds thrived in the mixture of fresh and ocean water. At one time there were some 300 loko i‘a in Hawai‘i. These played an important role in lives and culture of native Hawaiians. Migrating from the ocean directly into streams were certain kinds of animals. Unique species of fishes, shrimps, and shellfishes moved upstream into the plains and mountains to become the ‘o‘opu, ‘ōpae, and hīhīwai. These freshwater animals were used as food items by Hawaiians and were an important component in their diet. Thus as you now see, streams played an extremely important role in the lives of ancient Hawaiians. Care was taken not to pollute the water in streams that flowed down from mountains through the valleys into plains and out to sea. Without clean and ample free flowing streams in ahupua‘a, native plants and animals could not have survived. Without these plants and animals, native Hawaiians could not prosper and be wealthy. As you can imagine streams were, and still are, extremely important to the lives and culture of native Hawaiians. Illustration of an Ahupua‘a by Robin Y. Racoma, from From the Mountains to the Sea – Early Hawaiian Life by Julie S. Williams, 1997, 177 p. Published by Kamehameha Schools Press, Honolulu, HI. Courtesy of Kamehameha Schools.